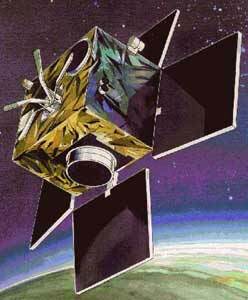 Astrid 1 is a small spin-stabilized satellite weighing 27 kg launched on 24 January 1995. It is Sweden's third scientific satellite and first microsatellite. Astrid 1 carries an Energetic Neutral Atom analyzer, an Electron Spectrometer and two UV imagers for imaging the aurora. The platform was designed and developed by Swedish Space Corporation's Space Systems Division in Solna, Sweden, while the payload was developed by the Swedish Institute of Space Physics in Kiruna. PIPPI (Prelude in Planetary Particle Imaging), a Neutral particle imager, is Astrid 1's main instrument. The operation of PIPPI in orbit was the first time that a dedicated instrument measured the neutral particle flux from the ring current. The instrument consists of two cameras. The SSD camera use solid state detectors which resolve the energy of detected particles. The MCP camera uses a technique whereby incoming neutrals cause charged secondary particles to be emitted from a graphite target. The secondaries are then detected by a microchannel plate (MCP). Both cameras have deflection systems which can reject charged particles up to an energy of 140 keV. The instrument aperture plane is perpendicular to the spin plane, all directions are thus covered in half a spin period or approximately 1.5s. PIPPI also serves as the data processing unit for EMIL and MIO. EMIL (Electron Measurements - In-situ and Lightweight), a Electron Spectrometer, consists of a swept-energy toroidal electrostatic analyzer and a microchannel plate (MCP) detector. The instrument measures the electron distribution at 62.5 ms or 125 ms resolution. MIO (Miniature Imaging Optics), an UV imaging photometers, are mounted in the satellite spin plane. One observes Lyman alpha-emission from the Earth's geocorona, the other observes auroral emissions. Each photometer consists of optics mounted in a stainless steel tube with a ceramic channel electron multiplier in the opposite end. Astrid 1 was launched together with the Russian navigation satellite Tsikada 1 from Launch Complex 132 of the Plesetsk Cosmodrome at 0354:22 UT on Jan 24, 1995 on a Kosmos-3M rocket supplied by the Design Bureau Polyot, Omsk. The Russian satellite was equipped with a special adapter for accommodating two microsatellites.